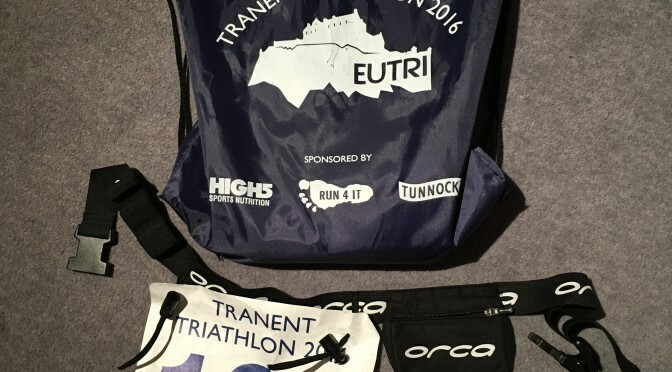 Tranent Sprint is run and organised by the Edinburgh University Triathlon Club (EUTri). I always have a soft spot for club organised races over the larger commercial events, and this was no different. 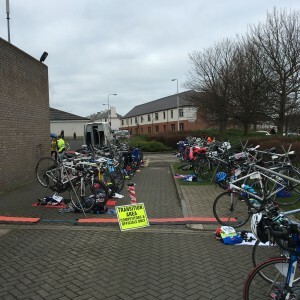 Whilst the event is missing some important parts, such as a secure transition zone, it also felt quite cozy and familiar. This is definitely in part due to the fact that the race was designated as one of my club’s Championship races, so there was a large turnout of Edinburgh Triathletes in attendance to keep me company while I waited for my heat to go off. The swim is a 25m pool swim in the Loch Centre. The races uses all 4 lanes, with 4 competitors to a lane, meaning heats of 16. Swimmers are seeded by their predicted swim time. I entered a swim time of 16:30 and led out my lane. T1 was not the fastest, but as I was putting on full gloves and a windproof, long-sleeved top, I wasn’t too disheartened. In a familiar story, I managed to mess my Garmin up here, so it went through both transitions and on to the run. One day, I’ll succeed in recording a whole race accurately! At the time, this is where it felt like the race starting going pear-shaped! Now, I realise that this was an average/respectable time for me, especially bearing in mind the terrain is much hillier than the pan-flat courses in London. In true Tri Excuse fashion, I’d also point out that I was held at a set of temporary roadworks for a while too. Having said that it wan’t a bad time, it is also definitely where the most improvement is needed and I have the most to gain. It was here where I lost most of my nice lead out of the pool, as several athletes sailed by me in the first few miles uphill. Sadly, I don’t think the bike will get the focus it needs in the next few months with preparation for the Edinburgh Half Marathon. I was in and out fairly efficiently. No major screw ups! Whilst I did pick up a few people back up from the bike, this was not a great run off the bike. Having once set a 5k PB in a sprint triathlon, I should be looking more towards sub-23mins for this. Again, a work in progress. The run course through some housing close to the Loch Centre was easy to follow and free of other users, so made for a nice little course. Whilst I should have been a little faster, I was quite surprised to find myself down so far towards to back end of the results list. I guess with it being the first local race of the season and a target race for the club, that upped the level of competition a little. Still, it’s good to get the year off to a start, and bring on the rest of the season!